Designs for a new 24-hour drive-thru on Lincoln Road, off the Holdingham Roundabout. 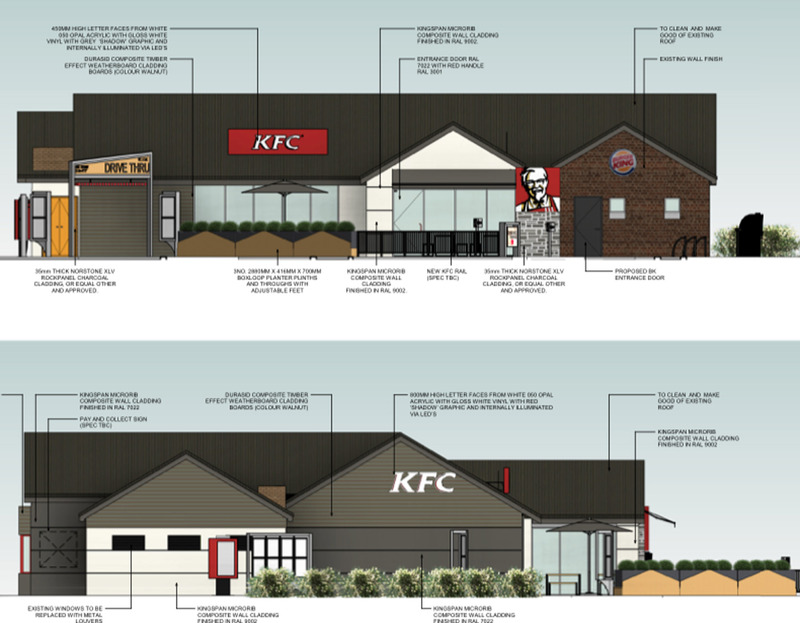 Proposals have been lodged for a new 24-hour drive-thru KFC restaurant on the Holdingham roundabout in Sleaford. The takeaway chain would replace the former Little Chef on Lincoln Road. Works would include a new outdoor seating area, drive-thru lane and reconfigured car park. Planners said in their application: “The existing brick and tile Little Chef building is dated. It contributes little to the site and its surrounds and is in need of refurbishment and updating. “Given the existing use of the building and the wider established service station uses, the proposal is considered acceptable in this location and compliments existing roadside uses required now in a modern facility. The drive-thru would be located next to the current Burger King. The site also includes a Burger King, Travel Lodge and Esso fuel station. Developers added there were no works planned for the attached Burger King unit. Proposals will be considered by the North Kesteven District Council planning committee at a laster date.